Publisher. Semi-pro magician. A notable eccentric. Invented Hummer Card Mystery (by 1940), Fantastric (by 1941), Parity Principle, Whirling Card (by 1944), and Poker Chip Trick (by 1947). Wrote Half-a-Dozen Hummers (1940, 12pp), Six Trix for 1944 (1944, 7pp), Little Stranger (c1945, 4pp), Thotography (c1945, 4pp), Mathematical 3-Card Monte (1951), Three Pets (1953), and Face-up Face-down Mysteries (c1945, 3pp). Tricks in Jinx and Ireland's YB: 1952 . See Karl Fulves (ed), Bob Hummer's Collected Secrets (1980, 109pp). 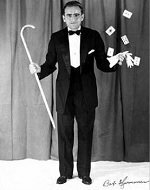 Here's a compendium of 13 of Bob Hummer's unique, mind-blowing stunts for magicians and mentalists. A baker's dozen mentalism and magic effects using cards and coins. Each one seems utterly impossible, yet they work every time. An entertaining mental feat with a borrowed deck of cards. From the brilliant mind of Bob Hummer comes a divination mystery that seems impossible, yet you do it every time. The performer takes the spectator on an adventure with a borrowed deck and a dead person's age (which is furnished by anyone in the room). In some uncanny manner, the "Whispering Spirit" aids the performer in solving the mystery. The performer does not need to touch the deck while they are in the spectator's hands. Using your own deck or a borrowed deck, you turn your back to the spectator. The spectator can shuffle the deck while your back is turned. The spectator removes the top 15 cards from the pack just as they come. From those 15 cards he is to remove all the black cards and put them in his front left pants pocket. The remaining red cards, he counts and then places them in his right front pants pocket. From the title, you'd guess that this is a fantastic trick. It's not. It's a true miracle of psychic entertainment! Here is an incredible mental miracle involving a deck of playing cards, which may be borrowed.